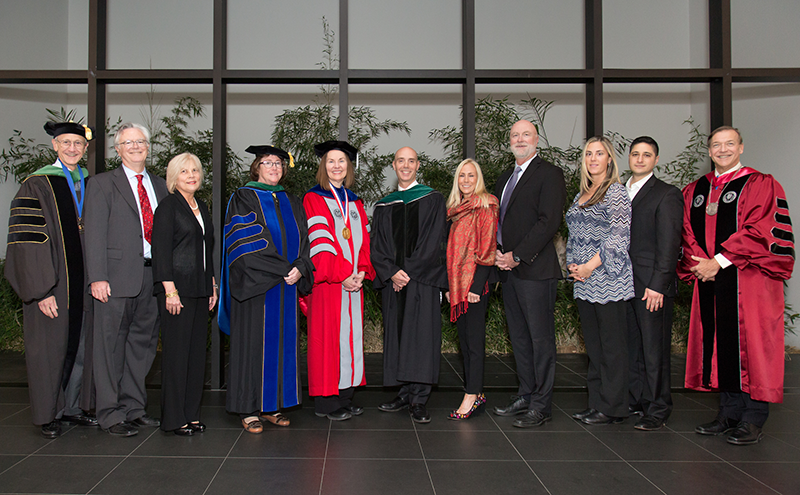 At an investiture ceremony on the Stony Brook University campus, three new endowed chairs were formally appointed; two leading pediatric clinical research physicians at Stony Brook Children’s Hospital and a renowned materials scientist and chemical engineer at the College of Engineering and Applied Sciences. The three new endowed faculty positions were funded by philanthropic gifts from the Knapp family through the Knapp Swezey Foundation, Island Outreach Foundation, and Jane and William Knapp respectively. One of Stony Brook’s best and brightest is William and Jane Knapp Chair in Energy and the Environment Esther Takeuchi, who holds a joint appointment with Brookhaven National Lab and Stony Brook University and owns the most patents (150 to date) of any woman in the U.S.
Takeuchi is currently directing a U.S. Department of Energy $10 million Energy Frontier Research award, leading the research on alternative, environmentally friendly battery systems with powerful energy and lifespan capabilities. Takeuchi is recognized for developing the battery technology that implanted cardiac defibrillators employ today. During his presidency, former President Obama bestowed her with highest honor possible for technological achievement in the United States – the National Medal of Technology and Innovation. Margaret M. McGovern, BS’78, MD, PhD, the Knapp Chair in Pediatrics, is a professor and physician-in-chief at Stony Brook Children’s Hospital. a board-certified pediatrician and a nationally renowned clinical geneticist. McGovern has a long-standing research interest and is an international authority on the inborn errors of metabolism and Niemann-Pick disease (NPD). McGovern has been instrumental in the launch of Stony Brook Children’s Hospital, Long Island’s first dedicated pediatric emergency department, a robust pediatric program – 30 specialties with some 200 practicing physicians – and the construction of the new Children’s Hospital building. Dr. McGovern has set a strategic vision and three critical missions for pediatric medicine at Stony Brook – providing expert clinical care to pediatric patients, educating medical students and residents, and providing faculty with an environment that encourages and supports innovative research. Christopher S. Muratore, MD, is Stony Brook Children’s Hospital new chief of pediatric surgery and Knapp Chair in Pediatric Surgery. Muratore comes to Stony Brook from Hasbro Children’s Hospital, a division of Rhode Island Hospital and Women and Infants Hospital of Rhode Island. A dedicated educator, he also served as director for the pediatric surgery fellowship-training program at the Warren Alpert Medical School of Brown University. His areas of expertise include minimally invasive surgery, neonatal intensive care and pediatric thoracic surgery. Muratore brings years of training in pediatric surgical research laboratories investigating the fetal treatment of congenital diaphragmatic hernia (CDH). He is a key investigator on the FDA-sponsored investigational device exemption for in utero tracheal occlusion for severe CDH, and he collaborated locally and nationally to advance fetal treatment having served as chair of the fetal diagnosis and treatment committee of the American Pediatric Surgical Association. For more than 25 years, said Dexter A. Bailey Jr., senior vice president for University Advancement, the Knapp Family’s generosity has impacted areas all across Stony Brook’s campus, including the arts, nursing research, alumni programming and tick-born disease research, as well as the University’s first endowed chair in pharmacological sciences, among others. Endowed faculty are the hallmarks of a great university and a lasting tribute to the generous donors who establish them. For more information on creating an endowed chair or professor at Stony Brook University, visit stonybrook.edu/endowedfaculty and for more on the Campaign for Stony Brook visit stonybrook.edu/campaign.